In the first of (what I hope to be) many postings of my homebrew recipes, here is one of my favorites. It is my take on a traditional gruit-style ale. I am starting with this recipe partly because it turned out very well, even winning 3rd place in the 2007 Greater Huntington Homebrewers Association Mountain Brewers Open. Also, I imagine that a lot of people will be wanting to explore the gruit style, since it doesn’t use any hops (or, at least, my recipe doesn’t use any hops), and with the hops shortage, I know a lot of brewers are looking for alternatives. I know what you might be thinking: “What self-respecting beer geek wants a beer with no hops?” Well, if that’s what you are thinking, then you really need to open your mind, and try this beer. I can’t stand the more-hops-is-always-better attitude, but thats a rant for another day. Lets get back on track. I got interested in gruit after reading Sacred and Herbal Healing Beers: The Secrets of Ancient Fermentation by Stephen Harrod Buhner. It is a great book about fermented beverages made by indigenous societies throughout history. There is a good section in there about gruit, and some of the traditional ingredients used in it. I created my recipe myself, but most of my inspiration for this recipe came from this book. Historically, I guess this style all but disappeared around the time of the Protestant Reformation. Before that, the Church controlled the ‘gruit houses’, which supplied the herbs used in this style of brew. They had a monopoly on this, which gave them a great deal of power. As the power was shifting away from the church, laws like Reinheitsgebot were enacted outlawing the use of these ingredients in beer (I am not saying that this was the only reason for Reinheitsgebot; as with anything in history or politics, there were a number of factors at play). In fact, many of the ingredients used in gruit were thought to have intoxicating properties on their own. Some historians consider Reinheitsgebot to be one of the first drug-control laws. I originally brewed this beer for my cousin Kelly. She has spent many years of her life in Asia, specifically China and Vietnam. She and her husband (then fiancé, obviously) chose the theme of ‘Double Happiness’ for their wedding, which I guess is traditional in that part of the world. I adopted the title for the beer I was brewing for the occasion. (As an aside, this was also my first experiment in making labels for my brew. What do you think?) My brother and I got together and brewed up 5 gallons of this for the barbecue on the day before the wedding. One cool thing I noticed at this barbecue was that the beer did not skunk. We were drinking it out or clear plastic cups in the sunlight, but there was no skunking. This isn’t really surprising, since the skunk aroma comes from compounds in hops reacting to sunlight (and there are no hops here), but it was cool. You can probably find some of these ingredients at your local homebrew shop, or you can order them from Wild Weeds. I didn’t plan ahead enough, so I ended up dry-spicing with the stuff I got from Wild Weeds, and put what I could find at my local shop into the boil. If you switch this up, I’d love to hear how it comes out. I mashed the grains as usual, and then added the honey in the beginning of the boil. The herbs were added as noted above. These herbs were added tot he secondary after racking, as if I were dry-hopping. Next time, I think I might tone back the Labrador Tea, since it was very dominant in the flavor profile. 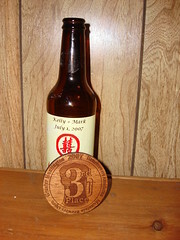 This entry was posted in homebrewing/beer and tagged beer, homebrewing, recipe. Bookmark the permalink. Post a comment or leave a trackback: Trackback URL. Thanks for sharing! I will defintely give this a go as I have been looking for a viable gruit option. I’ll keep you posted. When yu racked to 2ndary, did you put in dry herbs or create a concentrated tea and pour that in? I have heard that making a tea gives you a bit of control on the outcome. How long did was this in primary? 2ndary? aging? Phil, I’m glad you liked my posting. I’d love to hear how your brew comes out. I just put the herbs in dry. It’s true that this could introduce infection, but I think the risk is lessened, since at this point, most of the sugars have been converted to alcohol, so it would make for a pretty inhospitable environment for the nasty buggers. 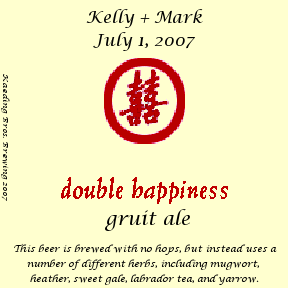 In your recipe for Double Happiness Gruit Ale you state “2gr Sweet Gale added in hopback”. This seems a very small amount to me – is it correct or should it be 2 ozs? (which is more like the quantity I have seen in other recipes). I am particularly interested in unhopped beers and I will certainly try your recipe. I will let you know how I get on. Yes, I only used 2 grams. I used one of the packets from Brewer’s Garden that I got at my local homebrew show. In fact, the second time I brewed it, I didn’t use sweet gale at all, and it really contributes very little to the flavor at only 2 grams. I would suggest you try using more, and see how it turns out. Sweet Gale is not very dense, so the 2 grams I used pretty much filled up my hopback; If I were to use more, I would probably either throw it in at flameout, or dry-hop with it. It has a very nice aroma, so I wouldn’t leave it in the boil for very long. Thanks for the feedback; let me know how your turns out! Interesting comments about the Sweet Gale – the Brewers Garden packet I have stresses that a little goes a long way and to use 1gm per 5 gallons. That said, for a Gruit I’m brewing soon, I’m going to use 1gm as a bittering addition at 60-45 mins and another gram at 5 or flameout along with similar measures Mugwort and Yarrow. Can’t wait to try this – thanks for the info! I’m looking for a gruit recipe. That book was also my first reading, but the herb amounts are very low compared to other recipes I’ve seen. After making this batch, what amounts do you think would be best for a gruit that is pleasing to modern tastes? That is a hard question. I found my recipe to be very pleasing, as did a lot of other people, most of whom were not necessarily craft beer geeks, but weren’t your average football beer types either. This recipe does come through with a strong rosemary flavor (from the labrador tea), which you may want to tone down. Other gruits that I’ve tasted have used a good amount of anise, though I personally don’t care for that flavor, so I opted to go a different direction. So, to answer your question, I’d say brew a batch using your best guess, and tweak it from there. Maybe you can even do a small batch, like 2 gallons, while you are dialing it in. I’m brewing up a 10-gallon batch of a gruit, and based on your recipe, I suppose I’ll bump up the grains to about 20-22 lbs, but with the herbs, do you think simply doubling them is fine? Thanks! I have a recently diagnosed hop-allergy so gruits will be the main things filling my carboys from now on. Wow, a hop allergy sounds pretty rough. I’m sorry to hear about that. I am not really sure about doubling the herbs. I think I would recommend using 1.5x as much herbs, and see how that goes. Of course, you will want to dial the recipe in to you personal preference anyway, but I think that will be a good starting point. Hey, sorry if this is a dumb question, but what is the final volume of the batch? 5 gallons? Not a dumb question at all! Yes, it was a 5 gallon batch. Great little article on gruit. Its nice to see people out there spreding the word and putting and end to this erra of “hoppism” in beers. The Buhner book was also a great inspiration for me and my own home brewing, I’ve been mading mead now for a few years and this book has been an incredible influence. Most of my brewing is mead based so all my sugars usually come from honey, but I have been experimenting with the making the odd braggot here and there. Just a few thoughts on your recipe based on my own experience. First off I wouldn’t boil your honey at all, it boils all the goodness out of it. Honey itself has antiseptic properties, there is no need to boil it. Simply disolve it into the hot wort as soon as you’ve finished your boil with the herbs. Keep spreding the word man, and good luck with you’re future batches. Cheers! Great, thanks for the tips! I will try them next time! Did you add any other honey or sugar when bottling for priming? I am new to hops-less brews and I am searching for different recipes, so I want to be thorough before I brew my first batch. Yeah, I usually use dried malt extract to prime my bottles, but corn sugar works well too. I’ve never tried honey, but I bet it would work well. What yeast do you recommend? I like WLP004 Irish Ale Yeast for this, but I think you could use any ale yeast, and have good results. All content Copyright © Patrick Kaeding 2019. All Rights reserved, unless otherwise noted.